Welcome to the magical world of crystal healing! Did you know that every gemstone holds power that goes far beyond its appearance? Pick one up and you’ll see what I mean! Crystals emit energetic vibrations that impact how you feel, sense, and interact with your environment – and you can work with them to strengthen your intentions. Whether it’s prosperity, wellness, love, creativity, or spiritual connection that you seek, working with gemstones is a wonderful way to manifest your desires and call healing into every facet of your life. When starting out, I recommend working with a book like “The Book of Stones” by Robert Simmons and Naisha Ahsian – you can use it to find a gem for any and every intention. And, to learn more about gems and minerals, click here to join my free Facebook group, Gem Haven. Or, if you’re ready to catapult your spiritual evolution, click here to sign up for Sage Goddess Soul Shift to journey with me through the worlds of crystal healing, astrology, plant medicine, shamanic journey work, and more. If there’s a particular stone you’re drawn to visually, I recommend trusting your intuition – the pull you feel may be a subconscious realization of an unexpressed need. Don’t ignore your instincts! Some people are highly sensitive to gemstone vibrations, while others are not. As you raise your own vibration, you’ll become more in touch with, and more readily able to use, your own intuition as a guide. Try not to assume that just because you aren’t sensitive to gemstone vibrations today, you aren’t able to work with them at all. Give yourself time, and recognize that energy work is a process and indeed a skill that you develop and hone over time. Intention set? Now, arm yourself with these tools! A piece of clear quartz or selenite – these stones carry high and pure vibrations and can uplift, absorb, and clear negative energies that may be blocking or holding you back. 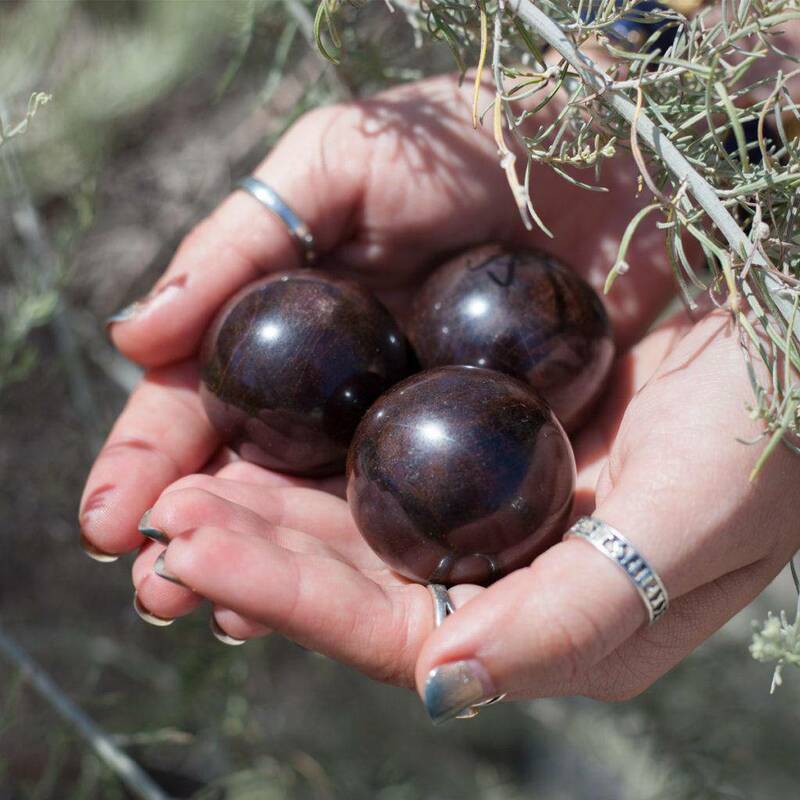 Obsidian, hematite, or black tourmaline – powerful grounding and protection stones. It’s important to remain grounded in magical work or to get grounded if you’re someone prone to living in your higher chakras. These stones are great for grounding you by activating your Root Chakra. Blue kyanite – the powerful healing and chakra alignment stone. It’s ideal for beginners because it attunes all chakras, opening them and bringing a healing vibration. This is also a stone that never needs to be programmed or cleared! Every crystal has a unique mineral structure that aligns with sacred geometry. This affects how that crystal works with your specific energy. Gemstones contain hexagonal, tetragonal, isometric, trigonal, orthorhombic, monoclinic, triclinic, or amorphous inner structures which align with the Platonic Solids, the basic building blocks of life. These structures are echoed throughout nature – even within your body! – and affect the way the crystal works on metaphysical levels. For example, hexagonal stones such as quartz tend to be the most powerful crystal healers, while isometric or cubic minerals like pyrite are good conductors of energy. Quartz crystals can be programmed to work with you on a specific intention. This makes them more powerful and effective energetic allies for crystal healing. Quartz is a crystal that can “act” as if it’s another mineral, taking on the properties of other minerals in metaphysical work. Quartz develops a relationship with its owner and creates a stronger energetic connection with you as the years go by. You can also meditate and program your quartz to magnify energies for health, happiness, prosperity, or whatever you seek. Program quartz by holding it in meditation and imagining the feeling or intention you wish to expand; then visualize the feeling or intention growing inside a sphere of white light emanating from your quartz crystal. When your work with the crystal is complete, deprogram the quartz by visualizing the release of a sphere of white light. Lemurian seed crystals and rutilated quartz contain unique messages and information. 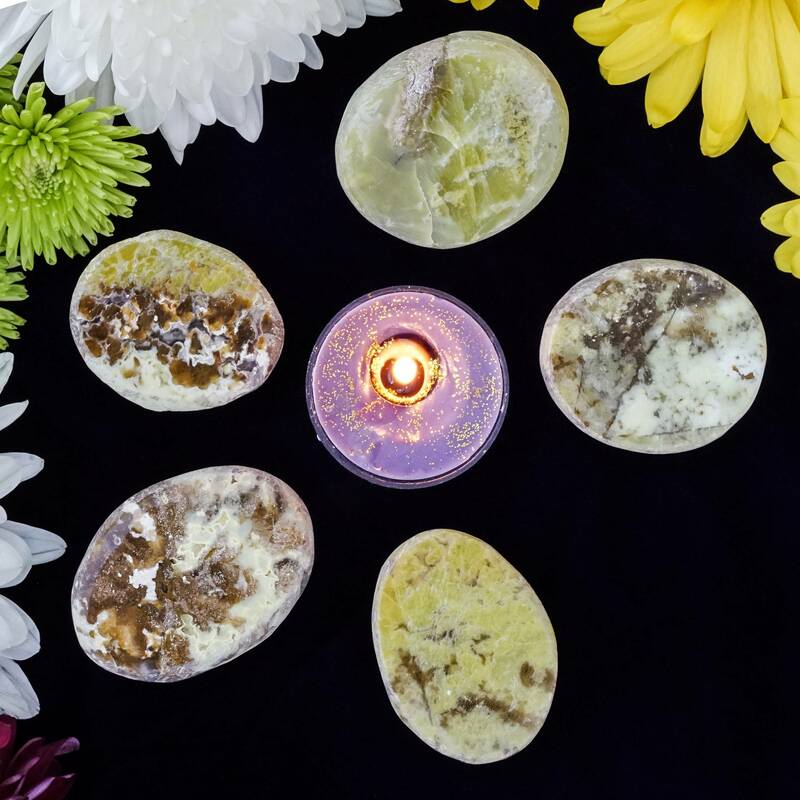 These crystals’ wisdom is stored within their lines and striation, and the messages can be translated during meditation and crystal healing sessions. Lemurian quartz has raised lines on every other side that can be rubbed to discern the “seed” of Lemurian wisdom contained within. And each line of rutile within quartz can be read in meditation to learn about your own personal transformation. Both of these types of quartz are said to choose their owner in order to transfer necessary wisdom and information. Crystals have magical correspondences and vibrate to specific numbers and astrological signs. There are stones you can work with based on your birthday and zodiac sign! For example, each sign has a “totem stone” that’s aligned with the energies of the astrological sign. And each month of the year also has a correspondence. These are my top 13 gemstones – ones that I believe will empower any collection. Some of them you may already own; others you may have never heard of! My hope is that you’ll explore these crystals to deepen your experience of gemstone magic. I feel gratitude for the blessings I have been given, and open my heart to those that have yet to come. Green aventurine teaches us the lessons of gratitude and appreciation. 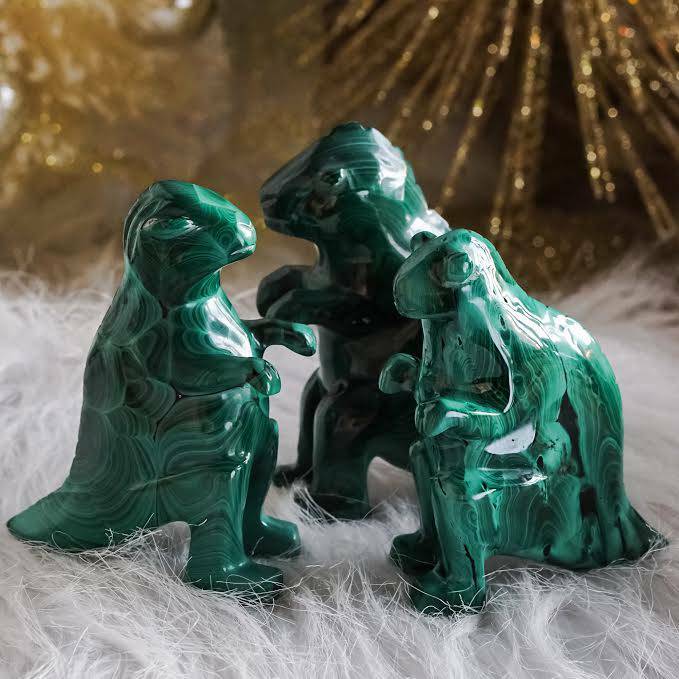 By encouraging us to feel grateful for the blessings we have already been given, green aventurine opens us up to receiving even more wealth and abundance. This gem helps you move through life with a sense of confidence and optimism and brings lightness, joy, and good luck to all situations. 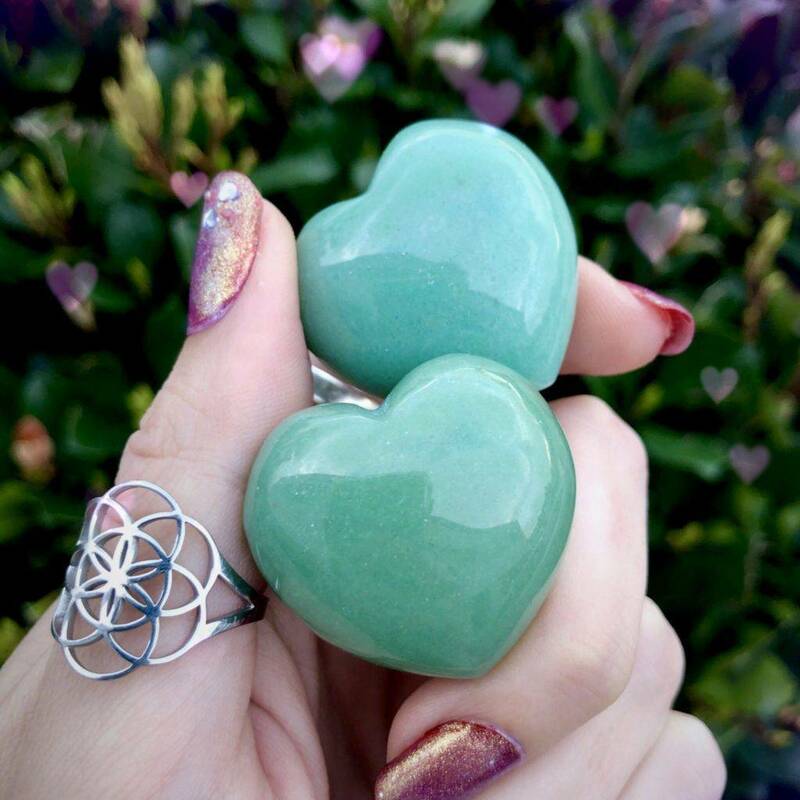 To work with this gem, hold to your Heart Chakra during meditation, use in a grid, place on your altar or in your sacred space, keep in your bag or pocket, or wear as sacred adornment. I trust my inner wisdom and open my eyes to see the things unseen. Often referred to as The Witch’s Stone, peacock ore resonates with both the Crown and Third Eye Chakras. This gem deepens your connection to the higher and spirit realms and will connect you with your innermost wisdom. 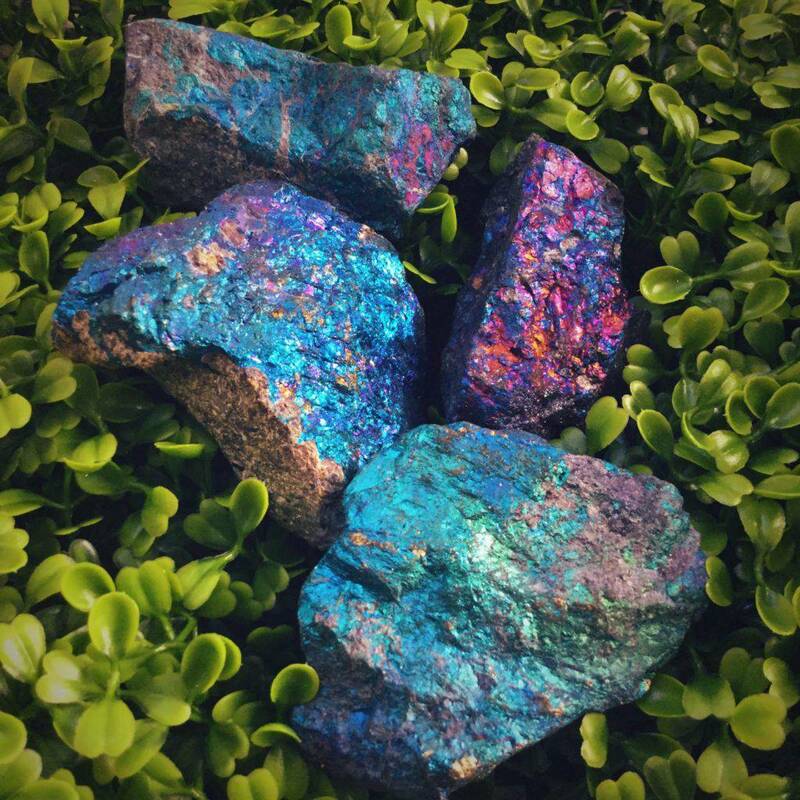 If you wish to deepen your psychic ability and intuition and come into contact with realms outside our own, peacock ore is the stone for you. To work with this gem, hold to your Crown or Third Eye Chakra during meditation, use in a grid, place on your altar or in your sacred space, keep in your bag or pocket, or wear as sacred adornment. I connect to Mother Earth with confidence and am strengthened by her essence. 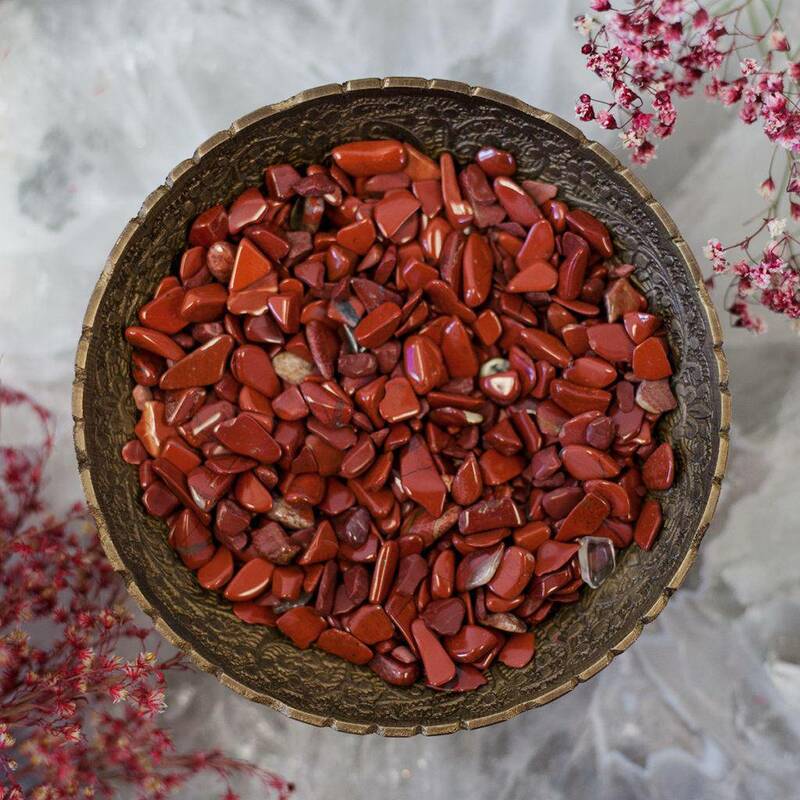 Red jasper is a stone of healing, restoration, and controlled passion. This gem brings erratic motions into balance and aligns everything: Your health, expressions, actions, and connections. Red jasper awakens the entire body, increasing stamina and strength. It’s also known to enhance memories and facilitate past life connection. To work with this gem, hold to your Root Chakra during meditation, use in a grid, place on your altar or in your sacred space, keep in your bag or pocket, or wear as sacred adornment. I am aligned with my divine gifts and innermost truths, and I express them with confidence. Known as the soul pathing stone, fluorite leads you to your highest calling. If you’re seeking to align with your innermost spiritual gifts and truths, this is the stone for you. This gem will encourage you to share your talents and communicate your divine truth from a place of confidence, clarity, and authenticity, and will give you a sense of confidence in your life’s purpose. Hold to your Throat or Third Eye Chakra during meditation, use in a grid, place on your altar or in your sacred space, keep in your bag or pocket, or wear as sacred adornment. 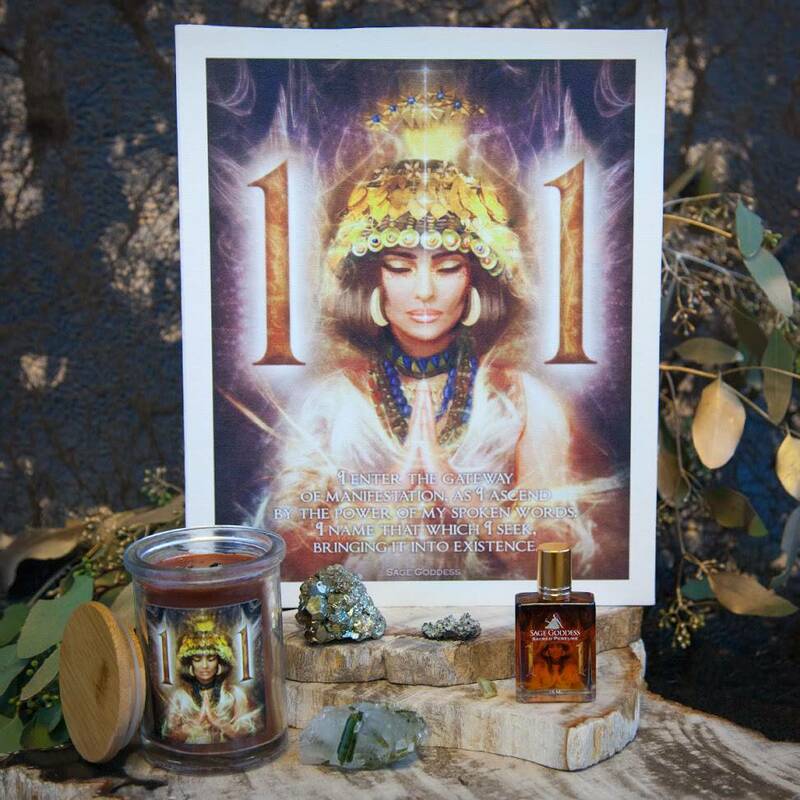 I allow healing energy to enter my mind, body, and spirit; I am rejuvenated and revitalized. Prehnite is a nourishing and nurturing gem found in India, and it is the only crystal in the entire world known to heal the healer. Corresponding to the Heart and Solar Plexus Chakras, prehnite helps stabilize the flow of energy in your body, reducing anxious energy. 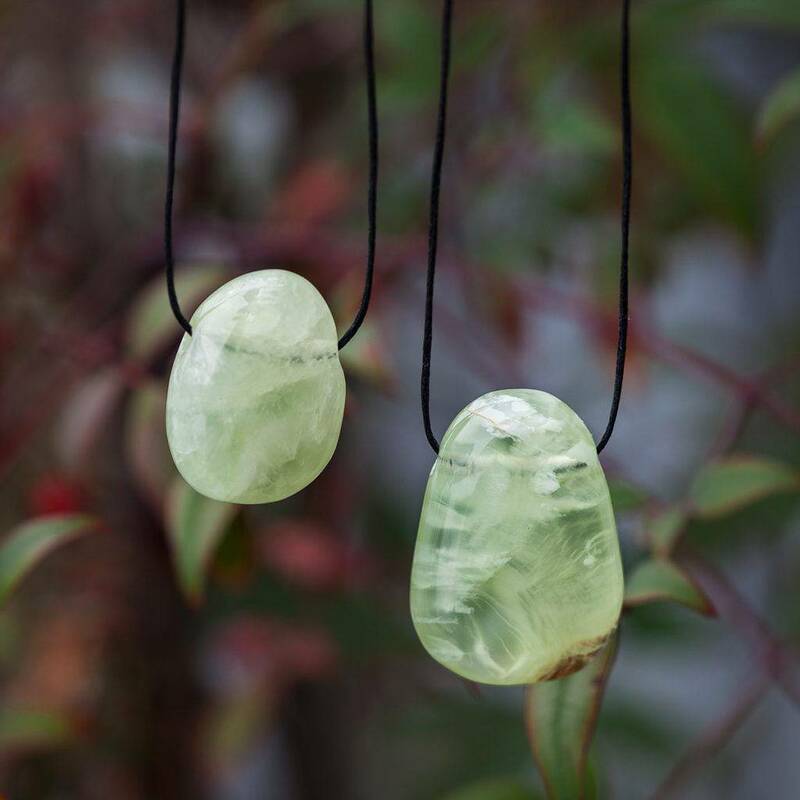 Prehnite grounds your energy into the heart of Gaia, connecting and encouraging a link between your heart and the heart of Mother Earth. To work with this gem, hold to your Heart or Solar Plexus Chakra during meditation, use in a grid, place on your altar or in your sacred space, keep in your bag or pocket, or wear as sacred adornment. I awaken to my innermost magic and embark on the journey of self-discovery. 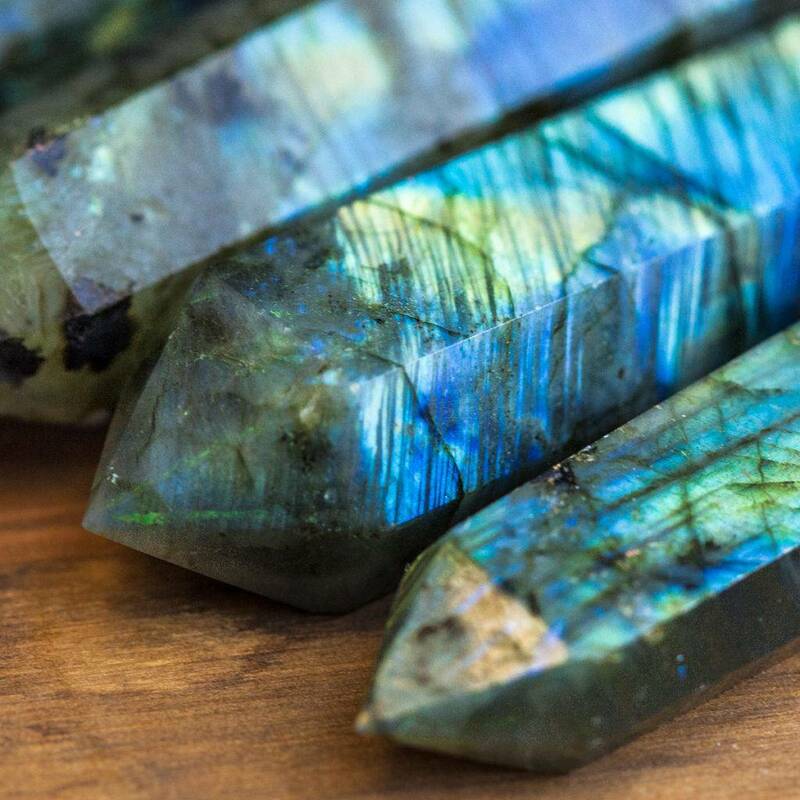 Labradorite is a stone of new moon magic and intuition. 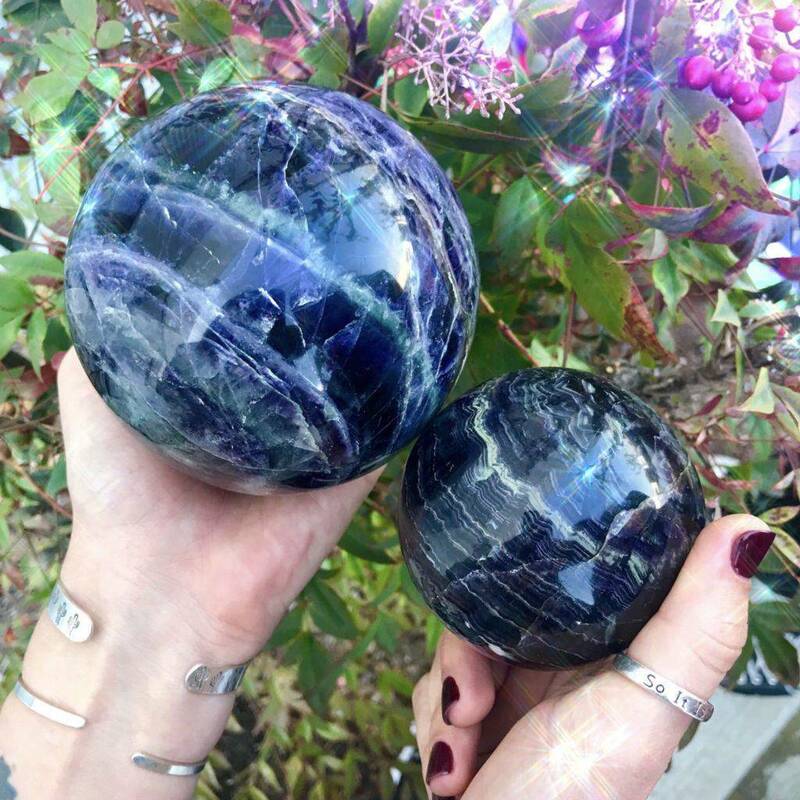 If you’re setting intentions under a new moon, or seeking to develop your psychic abilities, including clairvoyance, telepathy, astral travel, and fortune-telling, this is your stone. This gem softens the veil between our realm and others and leads us on a journey of remarkable transformation and self-discovery. Labradorite is also powerful in calling in your spirit guides, making it an extraordinary stone to turn to when in need of divine guidance. To work with this gem, hold to your Third Eye Chakra during meditation, use in a grid, place on your altar or in your sacred space, keep in your bag or pocket, or wear as sacred adornment. I attract what I seek with confidence and ease; I welcome in all of the wealth this world has to offer. Citrine is my go-to gemstone for manifesting abundance and wealth. This magical crystal awakens incredible creativity and willpower and gives you the boost of confidence needed to make your visions of prosperity a reality. Wherever this gem goes, positivity follows. 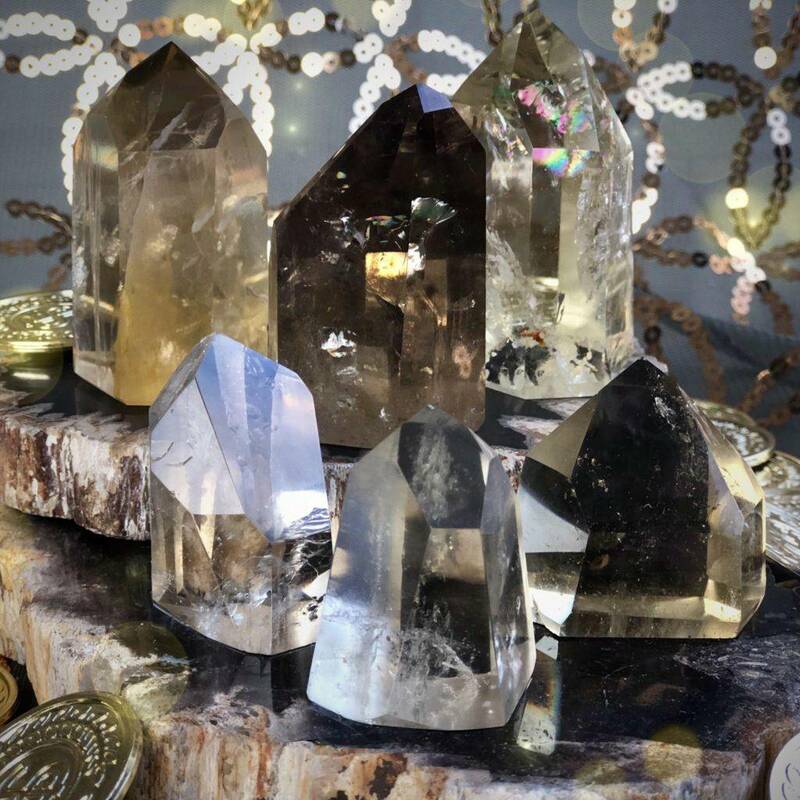 In the presence of citrine, your core, your vibrations, and your intentions become infused with energies of love, abundance, balance, and stability. To work with this gem, hold to your Solar Plexus Chakra during meditation, use in a grid, place on your altar or in your sacred space, keep in your bag or pocket, or wear as sacred adornment. I release energies and thought patterns that no longer serve me; I am tranquil and at peace with what is. Lepidolite is hailed by energy workers for its ability to positively impact mood. Our Native American ancestors would often rub their fingers along the surface of this stone, believing it to improve their mood, relieve anxiety, and dispel negative energy. Today, lepidolite is known to carry these same magical abilities. This gem aids our physical and emotional beings in so many ways. It provides peaceful sleep, promotes rest and recovery from illness, and soothes and harmonizes feelings, leading you to feel more settled and serene. 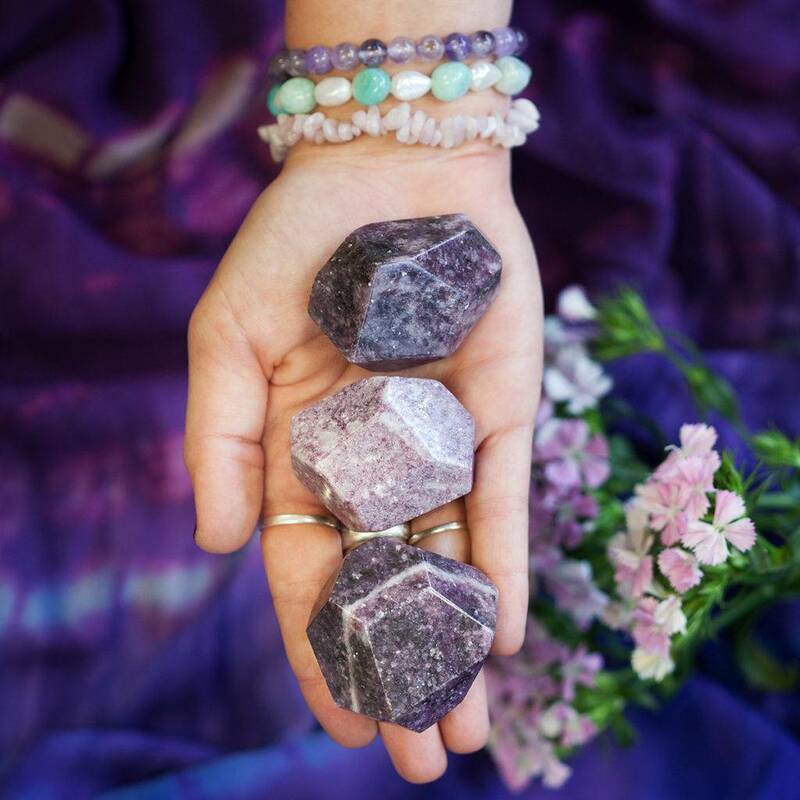 To work with this gem, hold to your Crown Chakra during meditation, use in a grid, place on your altar or in your sacred space, keep in your bag or pocket, or wear as sacred adornment. I move through the world centered and focused, protected and embraced by Mother Earth. Garnet is a stone of strength, centeredness, and safety. Throughout history, kings, queens, and warriors have worn garnet in their royal jewels and breastplates, believing it to be a source of courage and protection. This gem brings forth incredible vitality, security, and stability, and is a powerful tool for anyone who tends to feel ungrounded, scattered, or chaotic. This gem is also useful in grounding intentions, visions, and dreams into the earth so that they manifest into reality. I awaken my inner fires of passion, courage, and vitality and allow their illuminating light to radiate powerfully from me. Resonating with both the Root and Heart Chakras, ruby brings energies of confidence, passion, enthusiasm, and sensuality. This gem instills you with a sense of royalty and is hailed for its ability to call in Twin Flames and soulmates. 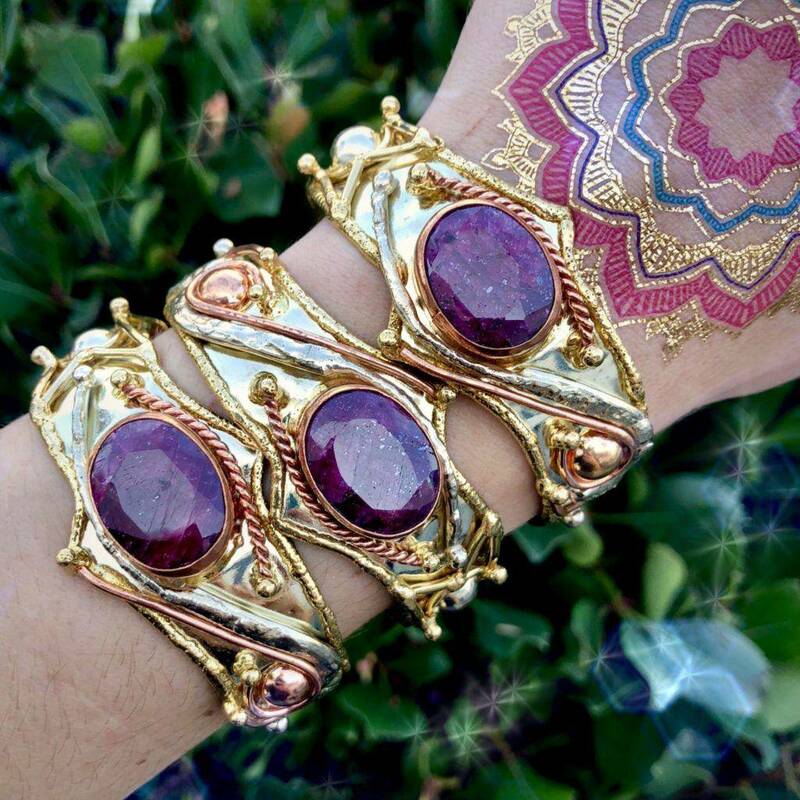 Said to ignite the soul, ruby will illuminate your inner fire, sending its light to radiate powerfully from you. Work with this gem to call in new love, boost your self-esteem, and raise your life force. To work with this gem, hold to your Root or Heart Chakra during meditation, use in a grid, place on your altar or in your sacred space, keep in your bag or pocket, or wear as sacred adornment. I feel the energies of passion and courage coursing through me, pulling me to accomplish what I’ve sought out to do. In need of energy? Confidence, passion, and power? If so, carnelian is your stone. This crystal is the gemstone form of caffeine. 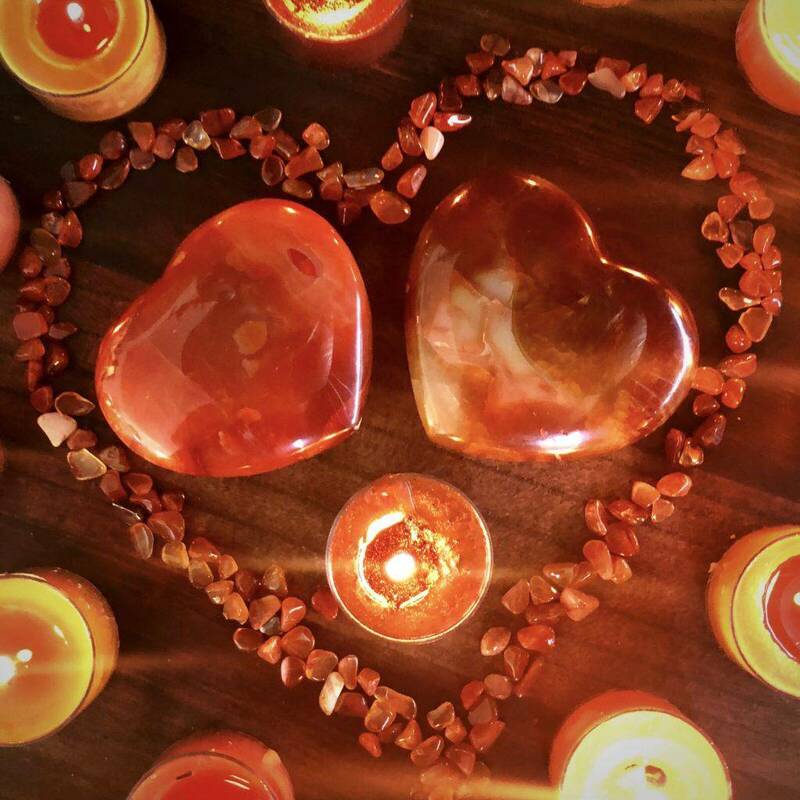 Resonating with both the Sacral and Solar Plexus Chakras, carnelian brings an influx of life force, a boost in creativity, and enhanced willpower. This gem increases vitality and zest for living and is especially useful for anyone looking to see their projects through to completion. Hold to your Sacral or Solar Plexus Chakra during meditation, use in a grid, place on your altar or in your sacred space, keep in your bag or pocket, or wear as sacred adornment. I am in tune with the deepest and most powerful parts of my being, free of any energies that keep me from my highest good. 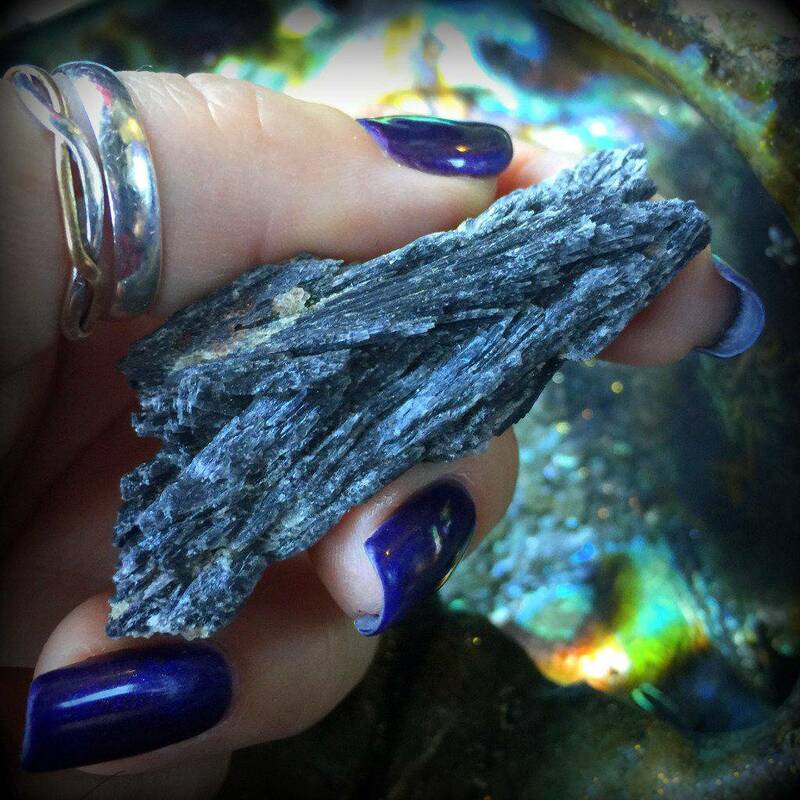 While there are many varieties of kyanite, black kyanite is by far one of my favorites. This gem is a talisman of supreme protection and purification. It wards off any and all energies that do not align with your highest good and replaces them with white light, so that you may remain positive, stable, and secure at all times. This stone is also useful in exploring the subconscious mind. Work with this gem in meditation to delve deeply inward and emerge with fresh insights on your spiritual path; it will keep you grounded and safe as you do so. I allow my inner royalty to empower me; I am present and connected with my deepest intuition. Known as the Queen’s Stone, lapis lazuli was highly prized by Cleopatra, who believed it to grant her supernatural powers. She had entire walls of her palace inlaid with it, and even had it ground into powder to use as eyeliner! Today, lapis lazuli is still hailed for is magical abilities. This gem activates your deepest intuition and insight and helps you feel more powerful and present in your life. 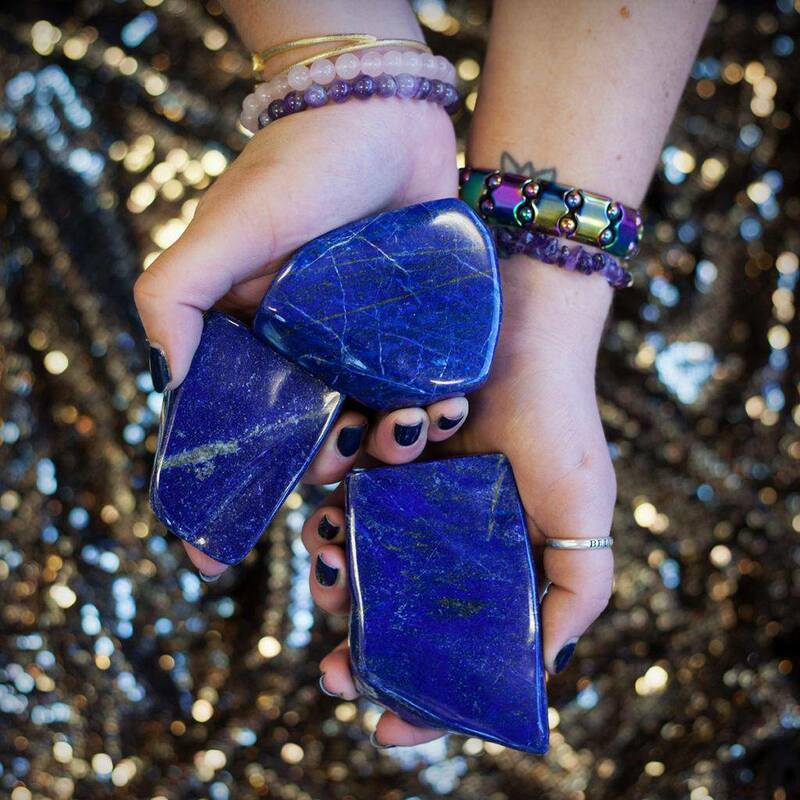 If you’re ready to unlock your inner royalty, lapis lazuli is the gem for you. To work with this gem, hold to your Throat or Third Eye Chakra during meditation, use in a grid, place on your altar or in your sacred space, keep in your bag or pocket, or wear as sacred adornment.